Afternoon tea is available at either 2pm, 2.15pm and 2.30pm or 4.30pm, 4.45pm and 5pm from Sunday to Friday and at 1pm, 1.15pm and 1.30pm and 3.30pm, 3.45pm and 4pm on a Saturday. You are welcome to keep your table for up to two hours. We're able to accommodate a maximum of twelve guests on any one table. There is a minimum spend of £37 per adult. 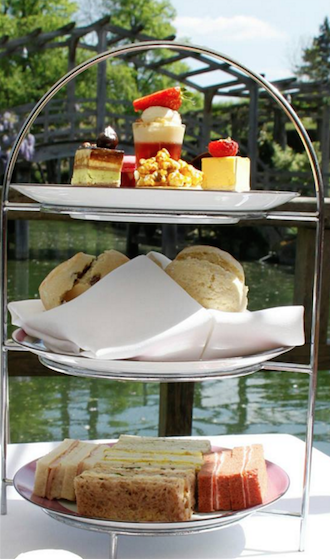 Great Fosters offers one of the most beautiful locations for afternoon tea in Surrey. Indulge in the most English of traditions whilst enjoying the view over the hotel's 50 acres of gardens or in the Winter months sink into a comfortable sofa in front of one of our fires. Afternoon tea is served in the The Tudor Room, Cocktail Bar, Main Hall and Anne Boleyn. During the summer months we also serve tea on the terraces overlooking our stunning gardens.